Our own personal, online treasure chest. Sharing random thoughts and ideas, special offers, and (potentially) treasured items. 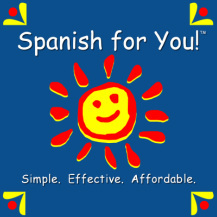 Spanish for You is a unique program that takes a whole new approach to teaching Spanish. Imagine finding a curriculum that isn't designated to a set age or grade. A curriculum that can be used for multiple levels at once, from the same book. A curriculum that offers a book as well as a full audio recording of the book both in a native speaking voice and a non-native voice that offers slower pronunciations for clearer understanding. Author, Debbie Annett, MSEd., of Spanish-for-You.net has tried very hard to create just that in her Spanish curriculum, Spanish for You. She has used this program herself for more than 4 years, but the curriculum has only been available for sale for less than a year. Her goal of making an affordable curriculum is one that she takes very seriously. The artwork for the books, done by her own daughter, brings a more relaxed appeal for the students. The black and white pages allow for students to get more hands' on by coloring the pages if they'd like. Her choice to offer some of the materials through downloads via PDF and MP3 formats allows the user to print only what is needed, when it is needed. Using any of the books in any order allows the cost savings of not having to stick to strict schedules and programs. The books contain instructions and guidance for the teacher and the student. Each workbook is able to span a full school year with 4 instructional days per week. The books take on a whole new approach in that they teach common language based on a theme, rather than parts of speech or functional phrases. It builds skills and familiarity for the formal instruction of older grades. While grades 3-4, 5-6, 7-8 are designated for the worksheets and activities, the material can be adapted for earlier ages. The worksheets are geared towards the reading and writing skills of each grade range, but are totally flexible. The author describes her curriculum as a "middle of the road Spanish curriculum" that tries to balance the European Spanish with North and South American Spanish so that a student may be able to function with any of the variations and dialects. Her position on language learning is that a student must have continued exposure and repeated practice rather than just occasional practice for fluency. There are currently 2 full programs available, Fiestas (Celebrations) and Estaciones (Seasons), and Viajes (Travels) coming in June 2013 with a trial version available right now. Optional teacher lesson plans for classroom use are available separately on the website. The trial packages start at $9.99, the regular packages are $39.95 each or $64.95 for the entire Grade 3-8 collection of a book. My experience with this program is a bit hard to describe. I love the concept, I love the layout. I am still a bit of a "fuddy duddy" and like paper. As much as I love my computer, I like having hard copies. Having downloads has great advantages with only needing to print what you need at a time, but feels like a bit of a handicap to me. I had the unfortunate experience of having a little one use my computer unattended and delete my files at one point. That turned into a great opportunity to see how the customer service skills stand up behind this new curriculum. I quickly emailed Debbie, and she was gracious and understanding and took care of my needs within hours. Her customer service was amazing! I love having the audio files to listen to in both voices, because to me, it was overwhelming to open that book for the first time and see words in Spanish with no idea how to pronounce them or even identify them (yeah, picture that deer in the headlights look, it may have been me!). Sure there are English words there, but my overwhelmed mind didn't see those right away. The non-native recordings include instructions in English, which was much more appealing to me as a total beginner. I can see the ability to go through this book twice, the first with the English helps, and the second in only the native speaking narration for even greater retention. With a wee bit of planning and preparation, it was easy to take this curriculum "on the road" and adapt for a recent road trip that was a 3 hour trip each way. Had I thought ahead, we could have used an MP3 player, but my laptop played the audio files just fine. Having that portability is very welcome. The more exposure I have to this program, the more I appreciate it and like it. I am slow to change some things, and while I would like to see the program offered on a disc as well as just downloads (because I don't do change well with how I handle my curriculum, not because it would in any way improve the program), I am glad I had the opportunity to try this one and look forward to seeing how this new curriculum takes off. It makes me think of "tv Spanish meets Spanish 101" and bridges the gap in between for younger students who are not ready for the formal instruction, but are beyond learning a simple word or phrase with their favorite cartoon characters. As a parent, this approach is more relaxed feeling and more practical for those with a more casual interest in language learning. I am "The Mom"... of 8 who likes to make items using various materials and methods. I try very hard to be frugal. What you see today, may not be my project of choice or interest next week. I like to try new things and perfect the things I like the most, but don't want to get bored with what I do. I love to recycle and re-purpose anything I can. Food, gardening, crafting are all fair game. Yes, even food...leftovers build character! I love books, and may just have an addiction. Trying new things might come in second place. This blog is the journal of the ever changing interests and trials of an adventurous mind that never stays in one place for very long. Don't forget! Party and Giveaway going on! I am not a fan of edited photos. All photos are raw, amateur shots. The only editing you will see is that for the sake of modesty or privacy. I am not a pro, not even semi pro (as if that isn't already obvious). I am a mom with a camera who wants to remember those special moments.